One of the most sought-after parts in the film was that of Bob, who gets his fair share of good lines as he applies his rough-as-guts love to the men he cares for in the boarding house. We’d always seen him as a slightly larger than life figure – in fact, back in the days when we still had a respectable budget, Timothy Spall was signed up to play the role. 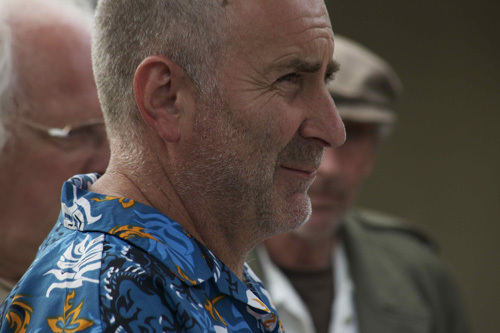 Greg Johnson, another long-timer in terms of NZ film and television, tried out for the role of Norm – not knowing that we’d already cast Ian Mune in the role. Our director Rosemary, who was doing the casting (and made a superb job of it) immediately asked him to read for the part of Bob. I must admit that at the time it surprised me. While Greg is not diminutive, neither is a bulky sort of chap such as I had imagined. To my astonishment and Rosemary’s satisfaction, Greg fell into the role like a natural, and blew away the opposition. Maybe it was decades of practice in swearing, but the oaths and curses rolled off his tongue in the same way that others use prepositions. His beautifully underplayed version of Bob conveyed exactly what we were looking for. Greg was always a lot of fun to have on set. He was mates with a large number of the actors we had cast for the boarding house roles, and together with them always managed a laugh in the long breaks between shooting. His instincts for the character he was playing were consistently insightful. His speech at a certain point (no spoilers here) was deeply moving. And when it came to an angry phone conversation, he brought the house down. We were surprised that after Rosemary called ‘cut’, loud applause issued from behind a closed door – turned out it was the manager and staff of the boarding house we were using as a location, who felt that Greg’s tone in rarking up the establishment was exactly right. The kind of repartee that developed between Greg and the others playing down and outs was so good that we shot and are pitching a television series featuring them, to be called ‘House of Bob’. Greg will be another in the hunt for best supporting actor role when the movie comes out. Absolutely outstanding performance he gave. Bloody brilliant, loved every minute of him.